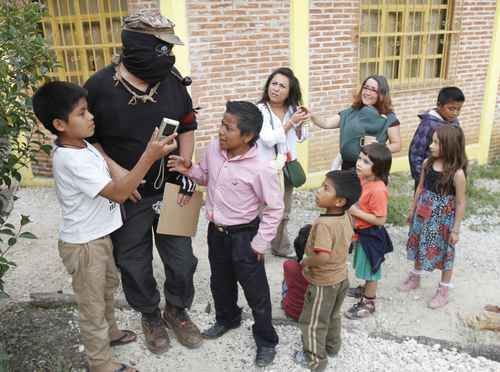 Before the start of the Seminar in the Caracol of Oventik, the EZLN paid homage to Compañero Galeano, the teacher, and also to Compañero Luis Villoro. Prior to the start of this anticapitalist gathering, SupGaleano issued an important communiqué called, in English, “The Storm, the Sentinel and the Lookout Syndrome,”  which puts the purpose of the Seminar in perspective, or better said, it puts the purpose of the Seminar into a Zapatista perspective. “We, the Zapatistas, see and hear a catastrophe coming, and we mean that in every sense of the term, a perfect storm.” However, he also says that others don’t see it coming, they don’t see what the Zapatistas see. He elaborates: “We see the tendency to resort to the same tactics of struggle, to continue with marches, real or virtual, with elections, surveys and rallies.” As if nothing has changed in the last 20, 40 or 100 years! We think they have the Lookout Syndrome. If you do the same thing over and over and it doesn’t work, maybe you should try something different! “We Zapatistas look sideways. 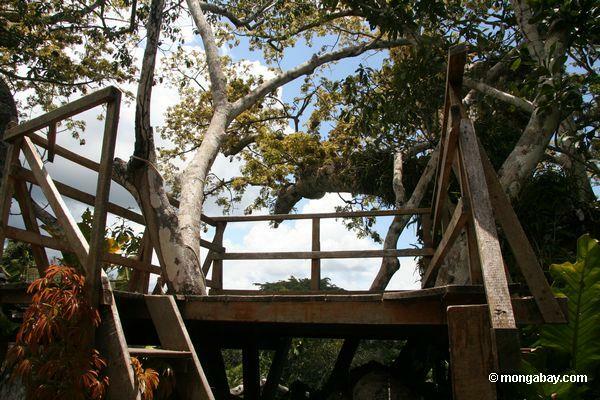 We pay more attention, climb to the top of the ceiba (tree) in order to try to see farther, not to see what has happened, but to see what’s coming.” And what they see is “something terrible, more destructive than ever.” But, Galeano admits, they can be mistaken. So, they want to hear what people from other geographies are thinking, what the compañeros, compañeras and compañeroas of the Sixth are thinking. That’s why they called for the Seminar, to share ideas. Every military installation has lookout towers, guard posts, watch posts, or whatever you may call them, a place where members assigned to that military installation take turns (shifts) at guard duty. Their role is that of the Sentinel: to survey the surrounding area to know who or what is out there; and to sound the alarm in case of an attack or other event. The EZLN is no different; its military members call the guard post the “posta” and take turns carrying out the role of the Sentinel, or lookout. But the important thing is that the Sentinel must be vigilant for signs of danger. If something big and destructive is coming, then the Sentinel must alert everyone to the imminence of the coming storm. Galeano says that, according to the Zapatistas, theoretical reflection and critical thought have the same task as the Sentinel. “Whoever works on analytic thinking takes a shift at the guard post.” The problem is that the Sentinel, or lookout, can become overwhelmed, overtaken by the task of critical observation and can develop the Lookout Syndrome. One way of counteracting the Lookout Syndrome is indirect observation or peripheral vision, also known as “looking sideways.” So, the Zapatistas are inviting people to the Seminar to look sideways with them at what is coming. With mid-term elections taking place in Mexico during June 2014, let’s see what thoughts looking sideways at elections produced. The Zapatistas have not been into voting for a long time. It makes sense for them because they have declared war against the Mexican government and have their own local and regional government. But what should everyone else do? Subcomandante Moisés says you can go ahead and vote, but don’t expect anything to change. We assume he means change for the better. And, indeed, if citizens are looking for fundamental progressive change in Mexico by means of the ballot box, they may have a very long wait! But, Moisés points out that whether you vote or not, you must definitely organize. If you want positive change you have to organize! On the other hand, what if you live in the United States? We have a presidential election in 2016 and candidates are already announcing their candidacy, starting to raise money and taking positions on issues. SupGaleano did not say in “The Storm, the Sentinel and the Lookout Syndrome” what kind of storm the Zapatistas see coming. Is the storm coming to Chiapas, to Mexico, or to the entire world? Will it come from war, climate change, drug-resistant diseases, one or more natural disasters or the depletion of our natural resources? We thought that perhaps the branches of the ceiba tree obstructed their vision. “We are facing a reality that is synthesized today in one word: Ayotzinapa. For we Zapatistas, Ayotzinapa is not the exception, but rather the current rule. It is the family portrait of the system on the global level. And the antidote for this profound crisis: ORGANIZE! Prepare yourselves! The dominant message of the EZLN’s Seminar is to organize. While Galeano uses examples from Mexico, he applies the control of international banking, privatization of our shared environment, corruption of the political classes and the loss of legitimacy of traditional institutions globally.